The Ahmaddiya Muslim Youth Association and the Indigenous Students’ Council from the U of S went on a holiday food drive Saturday morning. During one of the most critical times of year for the Saskatoon Food Bank and Learning Centre, a diverse pair of community groups banded together to contribute to the cause. 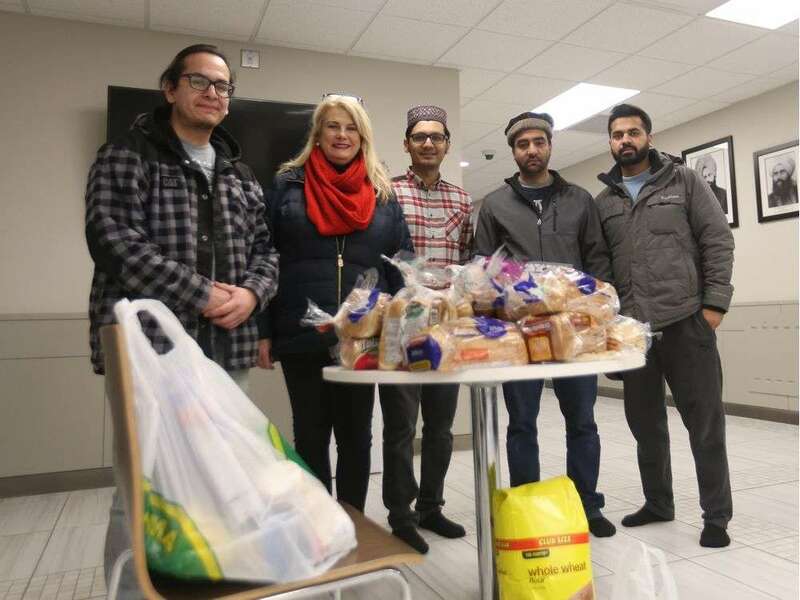 The Ahmaddiya Muslim Youth Association and the Indigenous Students’ Council from the University of Saskatchewan joined together Saturday for a food drive to gain donations for the food bank. A group of young volunteers met at the large Baitur Rahmat Mosque on the southeastern edge of Saskatoon on Saturday morning before heading out into the Rosewood area to go door-to-door to look for donations. Ward 9 Coun. Bev Dubois, whose ward includes Rosewood, said it was heartwarming to see different parts of the Saskatoon community come together for a positive and generous event during the holiday season. Regan Ratt-Misponas, president of the Indigenous Students’ Council, said Rashid Ahmed with the Ahmadiyya community in Saskatoon invited the Indigenous students to take part in the food drive this year, which he saw as a huge opportunity. “To do something as important as this work, being able to get into the community and lend a helping hand … it makes me hopeful for the future of the city and the future of our communities,” he said. This isn’t the first time that Indigenous students and the Ahmaddiya community of Saskatoon have worked together on a local project, and they’ve partnered on similar food drives in past years around the holidays. But Ratt-Misponas said the joint effort from the Indigenous Students’ Council and the Ahmadiyya community both allowed them to better serve the community and also gave the groups a chance to learn more about each other. “I think it’s very important that Indigenous people, Indigenous students and Muslim people come together to practise this healthy relationship that we’re working towards,” Ratt-Misponas said. Food drive organizer Rashid Ahmed works as a liaison between the Ahmadiyya Muslims and Indigenous groups like the student council in Saskatoon. Ahmed said the spiritual leader of the Ahmadiyya Muslim community worldwide, Caliph Hazrat Mirza Masroor Ahmad, encouraged the Ahmadiyya community in Saskatoon to connect more with the Indigenous community after his visit back in 2016. Ahmed said he was “honoured” when Ratt-Misponas said the students would give their support, and he hopes this is just one more positive action the Indigenous and Ahmadiyya communities can take in the community together. It’s not only providing support to humanity, Ahmed said, but also an opportunity to connect with the people of Saskatoon in one more way and learn from each other. Ahmed said last year they managed to gather more than 650 pounds of food from the local community and this year they’re aiming to bring more to the food bank. It is amazing how the Ahmadiyya Muslim Jamaat and the Indigenous community were able to come together and work on a project together. Not only did they learn more about each other, but also they were able to serve the community in the best way. I hope there are more projects like this in the future.